All parishes are encouraged to have funeral ministry teams trained in offering support to the bereaved. In a week during which the Vatican spoke against the practice of scattering the ashes of the dead, the Dublin Archdiocese issued a new policy on funeral ministry that proposes the greater use of columbaria, that is, places dedicated to storing cremated remains. The policy encourages all parishes to have a funeral ministry team, consisting of religious and lay men and women, who have been trained in providing support to the bereaved. On receiving word of a death, one or two members of the team would visit a bereaved family to sympathise with them and to assure them that the parish community is praying for them and their loved one. The team would also bring a funeral rite booklet containing suggested readings and prayers of the faithful. In relation to cremated remains, the Dublin Archdiocese is proposing that parishes look at the possibility of establishing columbaria, which are places established for the respectful and usually public storage of urns containing ashes. It envisages these being located in graveyards attached to parish churches, in church crypts or in ‘surplus space’ in large churches. 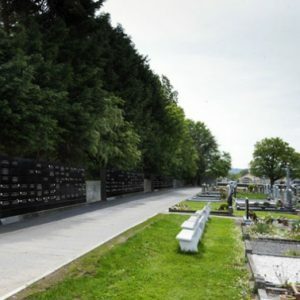 The archdiocese notes that not all parishes will be able to provide columbaria, that they will require planning permission, and that the requirement to keep remains in perpetuity is an onerous one.